I had planned to have this post up days ago but unfortunately, we got hit by the flu at home so it's been a long week - and it's only Tuesday! Nevertheless, the minis are feeling better so that's what matters most! Being summer, there are so many cute sandals and flats out there but the most comfortable shoe in my current rotation are the classic Adidas runners. 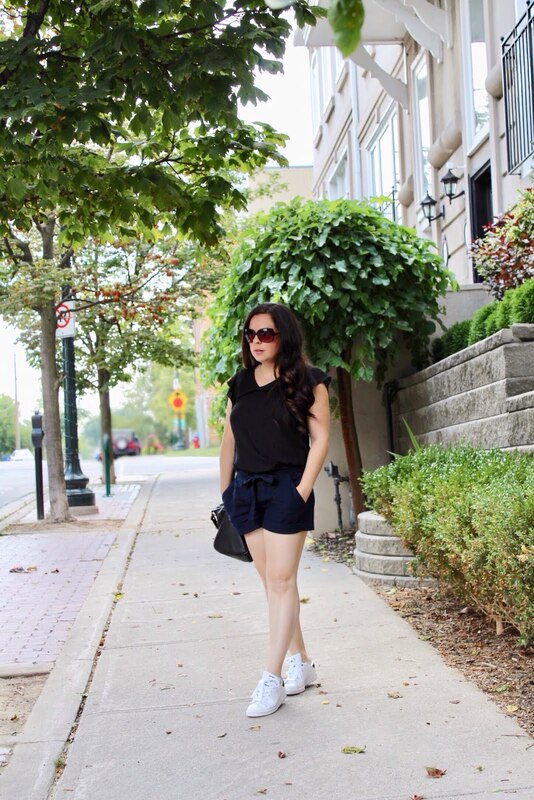 I paired them with these navy shorts with a tie up belt that I'm currently obsessing over. I love the extra little detail, giving your shorts a mini facelift this summer. These ones are a linen-like material so they are soft and will keep you cool during the hot months. I added a basic black tank but the ruffles on the sleeves are an added a feminine touch. This one has a V neck but it isn't deep V, making it the perfect casual tank.